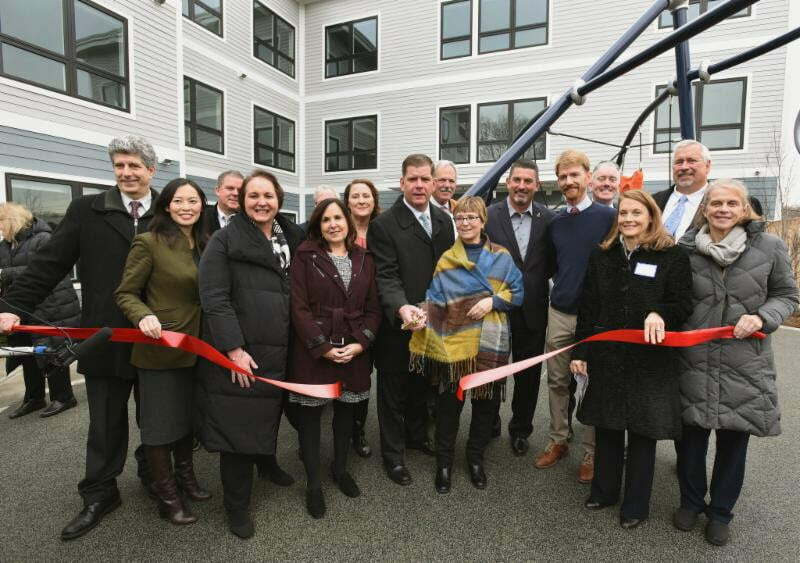 Mayor Martin J. Wash today joined Southwest Boston Community Development Corporation, Traggorth Companies, elected officials and residents to celebrate the grand opening of The Residences at Fairmount Station. This once-vacant property is now a transit-oriented residential development that offers 27 rental units, including 24 affordable units. The project is part of a larger City effort to prioritize affordable development along the Fairmont Corridor, one of the action areas outlined in Imagine Boston 2030 with the goal of expanding opportunities and reducing disparities for residents in the area. The $12 million four-story building features a combination of studio, one-bedroom, two-bedroom, and three-bedroom units. Out of the 27 rental units, 24 are affordable to households at or below 60 percent of Area Median Income (AMI), which is around $51,000 for a two-income household. The remaining three units are designated for households at or below 70 percent AMI, or around $60,000 for a two-income household. The development also offers 6,000 square feet of green space and play space, a public community room, and parking spaces and bike spaces. The project is LEED Silver Certified and has many green features for long-term operations, sustainability, and includes several improvements such as new sidewalks, handicap accessible ramps, benches, lighting, bike racks, and a playground. The building was designed by DMS Design, constructed by Delphi Construction, and will be managed by Maloney Properties. Southwest Boston CDC will provide ongoing services to residents. The new development has been made possible in part by a City of Boston contribution of more than $1.7 million. This contribution enabled the development team to take advantage of more than $2.5 million from the Commonwealth’s Department of Housing and Community Development. The State also provided an allocation of almost $1.5 million in federal Low-Income Housing Tax Credits (LIHTC) that helped raise over $4.7 million in equity from National Equity Fund, the equity investor in the project. Webster Bank provided a construction loan with MassHousing providing long-term permanent financing. The Community Economic Development Assistance Corporation (CEDAC) and the Equitable Transit-Oriented Development Accelerator Fund (ETODAF) at LISC Boston provided critical predevelopment and acquisition funding to secure the site. The Residences at Fairmont Station consist of affordable units to low- and middle-class families and strongly aligns with the City’s housing goals outlined in Housing a Changing City: Boston 2030. Mayor Walsh recently increased the City’s overall housing targets from 53,000 to 69,000 new units by 2030 to meet Boston’s population growth. These updated housing goals build on Mayor Walsh’s commitment to increasing access to home ownership, preventing displacement and promoting fair and equitable housing access. Since the release of the original Housing a Changing City: Boston 2030 plan in 2014, income-restricted housing stock, designed to increase affordable housing, has grown along with overall new production: nearly 20 percent of housing units are income restricted, and 25 percent of rental units are income restricted. In total, after creating an additional 15,820 units of income-restricted housing, Boston will have nearly 70,000 units of income-restricted housing by 2030. These income-restricted units will include purchasing 1,000 rental housing units from the speculative market and income-restricting them through an expanded Acquisition Opportunity Program. In addition, the City will soon announce awardees of an affordable housing funding round that includes more than $16 million in city affordable housing funds, and the first large scale awards of Community Preservation Act (CPA) funding for affordable housing development projects.